I have a gorgeous Indie polish line for you today. Liquidus Nail Gloss is gorgeous. And for the next 14 days you can use the code "SETINLACQUER10OFF" to get 10 percent off of your total purchase. Liquidus is where crystal meets liquid, where trends meet fashion, where nature meets nail polish. These polishes were perfect for the water marble accent nail art I created. I love water marbling. You never quite know what you are going to get. But I am certainly pleased with the way this one turned out. These polishes applied wonderfully - silky smooth and even. These polishes from the Summer 2014 collection are stunning. This shimmery bright yellow polish was inspired by the yellow variety of quartz. It's vibrant and summery and the light shimmer radiates the shades of the sun. This is two coats with a top coat. This shimmery bright orange coral polish was inspired by the pinks and oranges of the living gemstone, Coral. It's a bright jelly polish that applies wonderfully. I love the bright shade. This is three coats with a top coat. This deep black polish has a hint of a sapphire blue shade. This polish was inspired by the deepest blues of the Sapphire mineral. It dries matte and has a hint of shimmer. This is two coats with no top coat applied. Who would have thought that water marbling with a shimmer, jelly and matte polish would create such a stunning water marble? I love the way the accent nail turned out. I may have to do this on all my nails! The creator's family is interested in geology so all of their nail polishes are inspired by rocks, gems and minerals. Their nail polishes are cruelty 3-Free (free from Dibutyl Phthalate (DBP), Formaldehyde and Toluene). These polishes are gorgeous and well worth picking up and adding to your stash. They are available on the Liquidus Etsy store for $9. But don't forget for the next 14 days you can use the code "SETINLACQUER10OFF." Make sure to follow Liquidous on Facebook and Pinterest to get information on new releases and launches. Pond nail art that's... well... a pond! I recently started using the "pond" method for some nail art. 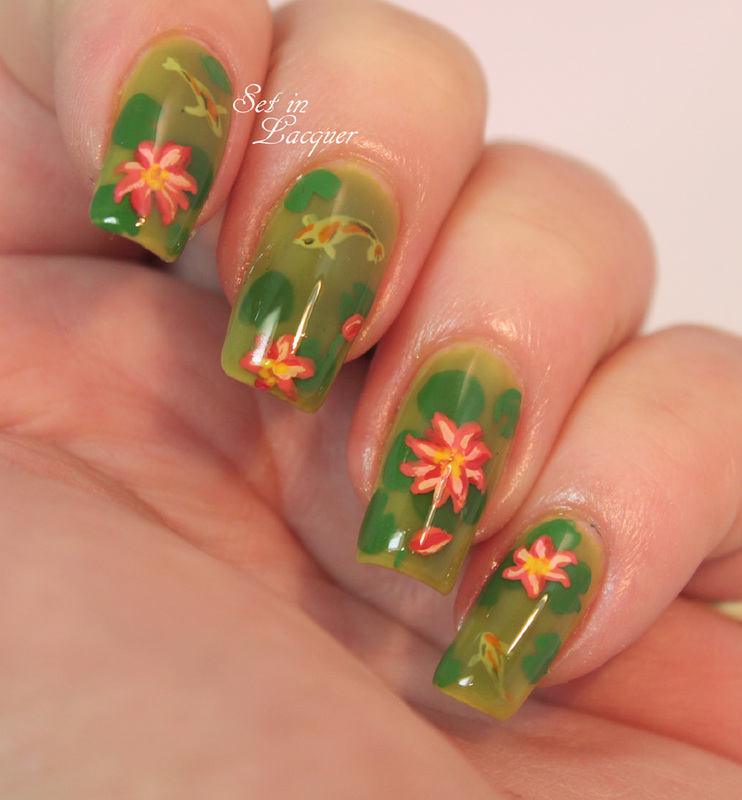 Pond nail art is when you use jelly polishes and layer art between the layers - several layers. It is similar to a jelly sandwich. 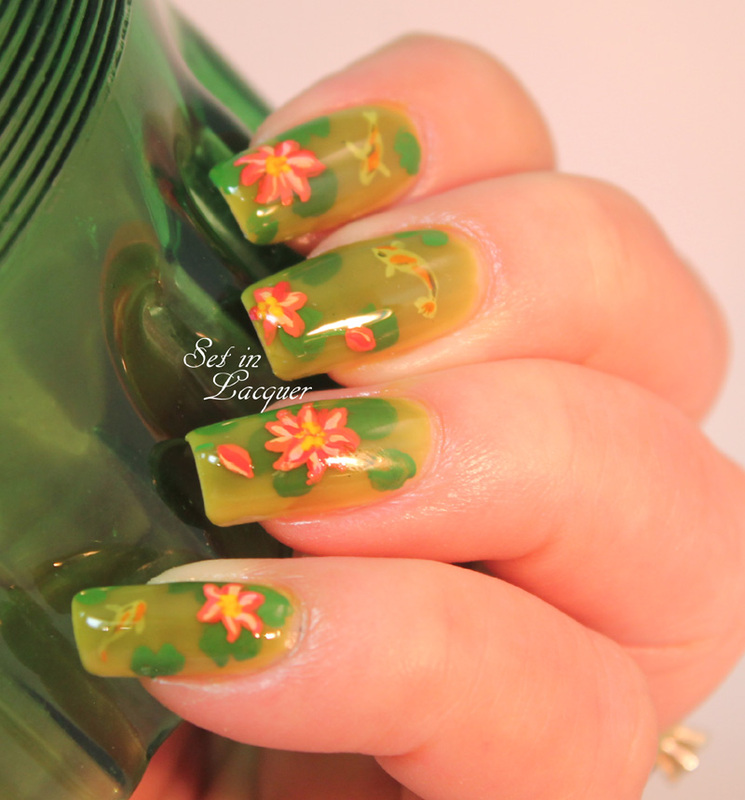 Previous to this mani, I just painted flowers between the layers. This one is a bit different. I decided to create an actual pond "pond" mani. It's complete with Koi fish, lily pads and a couple of lilies! I really enjoyed creating it and love the way it turned out. I used a murky green jelly polish (Liquidus Peridot) for the base color. Then I used acrylic paint for the Koi fish. I added another layer of jelly polish, and then painted a lily pad. 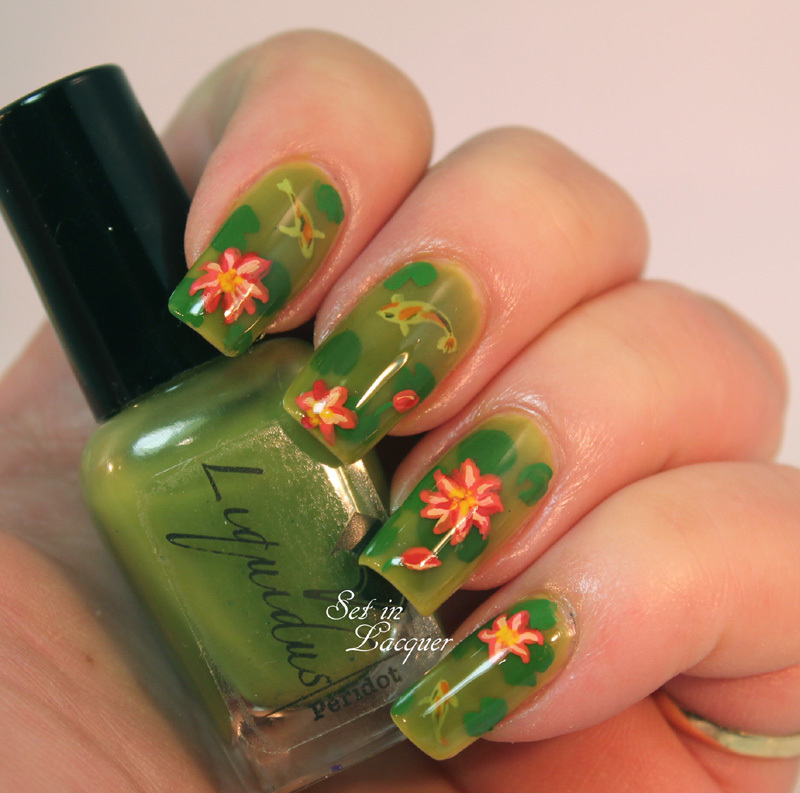 I repeated the process a few times with the jelly polish and lily pads. Then I used acrylic paint and created the lilies and buds on top of the last coat of jelly polish. I love the depth of this. It really does appear that the fish are below murky water. What would you create using this nail art method? This polish was previously sent to me for an honest review. All opinions are my own. I have a gorgeous Indie polish line for you today. Liquidus Nail Gloss is gorgeous. And for the next 10 days you can use the code "SETINLACQUER10OFF" to get 10 percent off of your total purchase. Liquidus is where crystal meets liquid, where trends meet fashion, where nature meets nail polish. 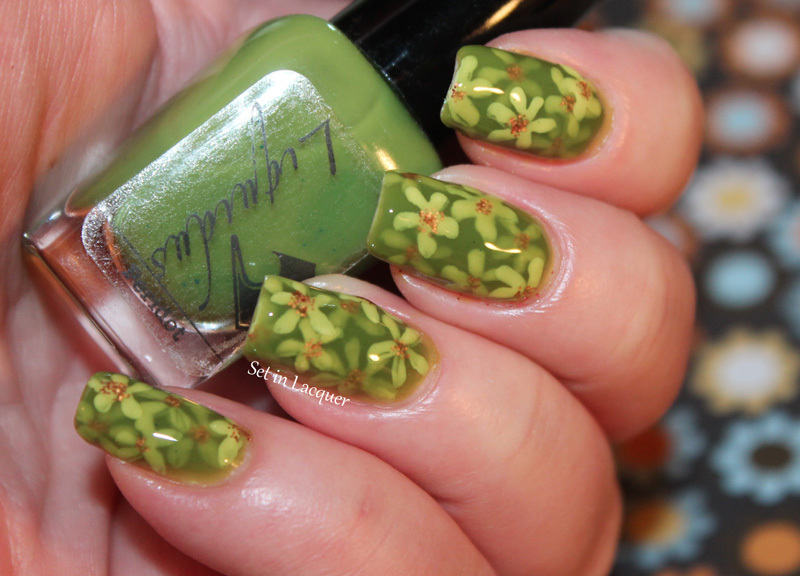 These polishes were perfect for the floral pond nail art I did. Make sure to take a look! I had never tried one before but Jacki from Adventures in Acetone has a tutorial on it. Her manis always look so stunning that I just had to try it! These polishes applied wonderfully - silky smooth and even. They have a high gloss shine that brings out the color even more. These polishes from the Spring 2014 collection are stunning. First the nail art and then we will move straight into the swatches. I love the way the flowers look so multi-dimensional! 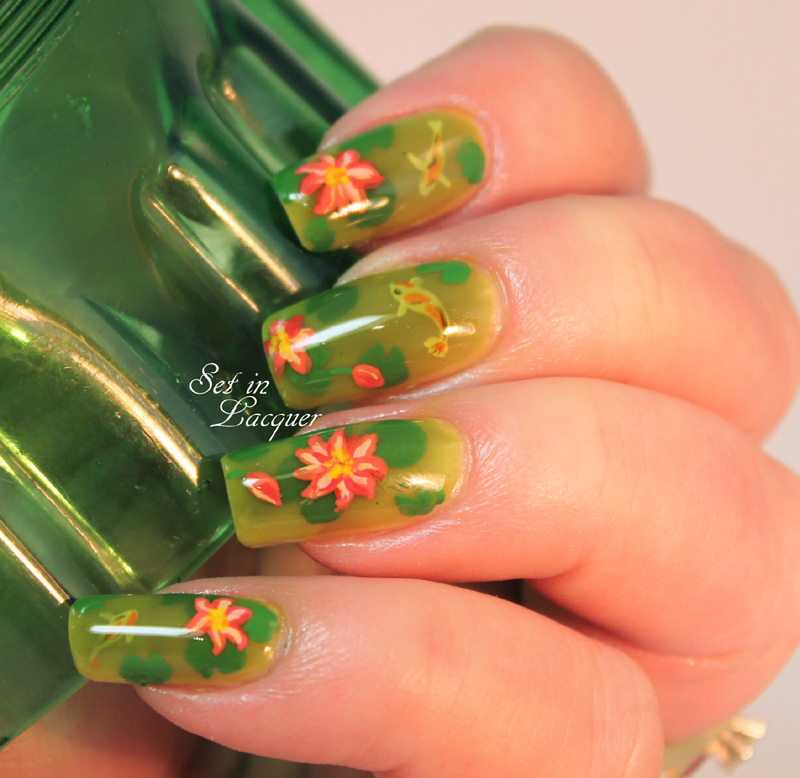 Peridot is the perfect jelly polish to use for this mani. I used all three of the polishes in this creation. It is simple, but time consuming. I love the way this one turned out. It reminds me of print on a Hawaiian shirt. I am not going to post a tutorial for this one. The one listed above is perfect. Morganite is a gorgeous, shimmery off-white polish. It applied flawlessly. I can see me using this one in many nail art creations. This is two coats. Rose Quartz is stunning micro-glitter polish that can be used as a top coat or on its on with several coats. I have it on here over Morganite. The first photo is one coat. 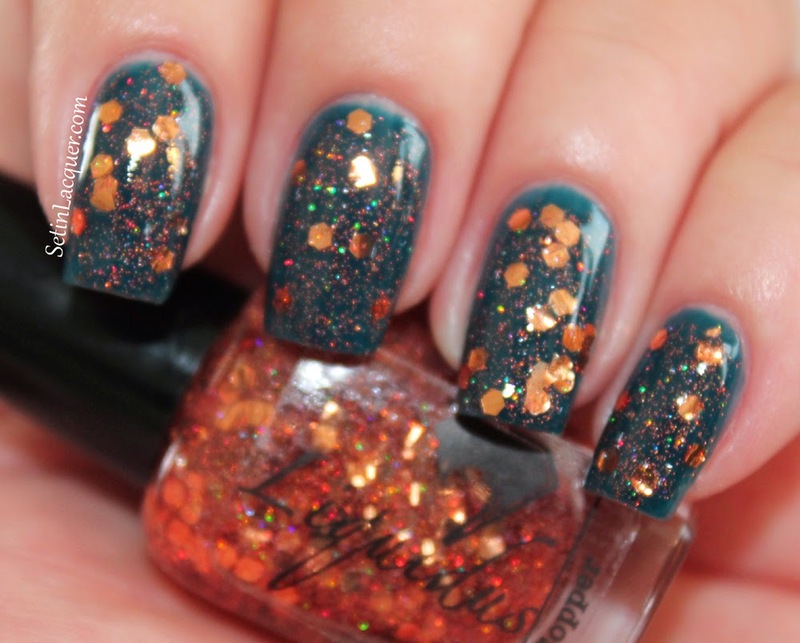 It applied evenly and is the perfect glitter for an accent nail or to spice up an oh-so mani. Here it is with two coats over Morganite. 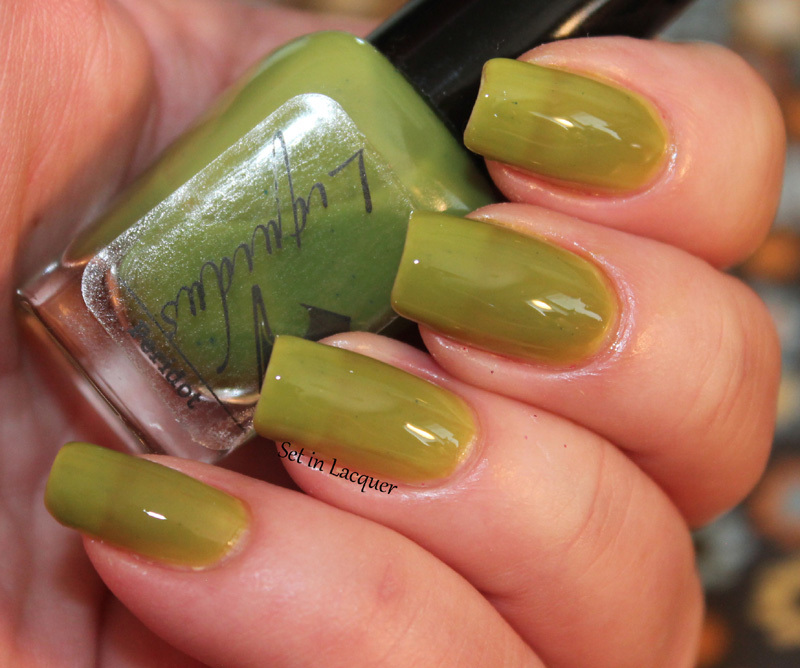 Peridot is a olive green jelly polish. I like jelly polishes for creating jelly sandwiches and now, pond manis. 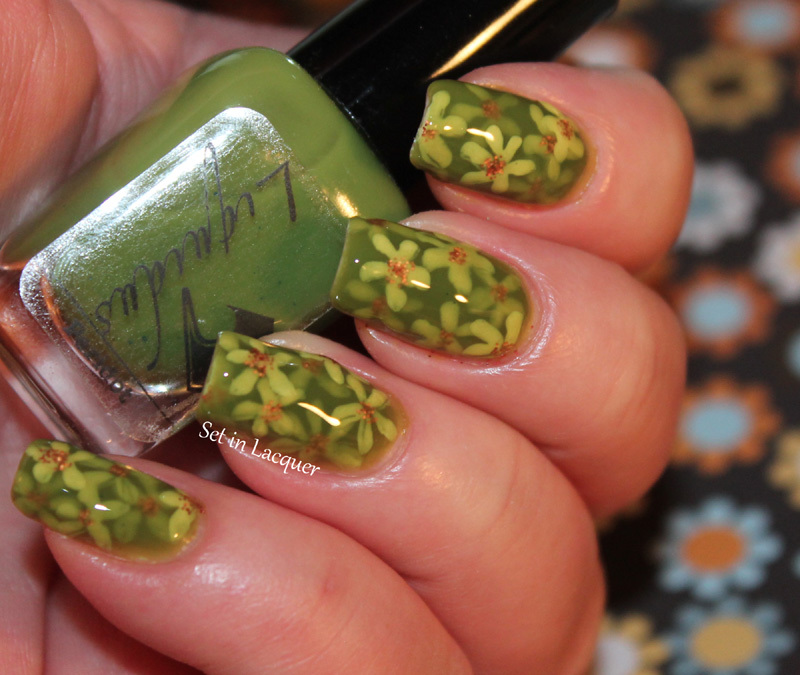 This one is on the sheer side, which is why it worked famously for the pond mani I showed above. These polishes are gorgeous and well worth picking up and adding to your stash. They are available on the Liquidus Etsy store for $9. But don't forget for the next 10 days you can use the code "SETINLACQUER10OFF." Make sure to follow Liquidous on Facebook and Pinterest to get information on new releases and launches. These polishes applied wonderfully - silky smooth and even. They have a high gloss shine that brings out the color even more. This Fall 2013 collection is stunning. Let's move straight into the swatches. Arsenic - is a gray cream with a hint of copper and yellow shimmer. This gray/taupe toned polish is perfect for those crisp Fall days. This is two coats. The subtle shimmer in this one is stunning. This is inspired by the poisonous mineral, Arsenic. Blue Diamond Turquoise - is my favorite. I am in love with this deep glossy teal. I know there are some teal lovers out there that will love this one. I know I do! This is two coats and the glossy shine is spell binding. This is inspired by the darkest of the turquoise that is mined from the Blue Diamond Mine. 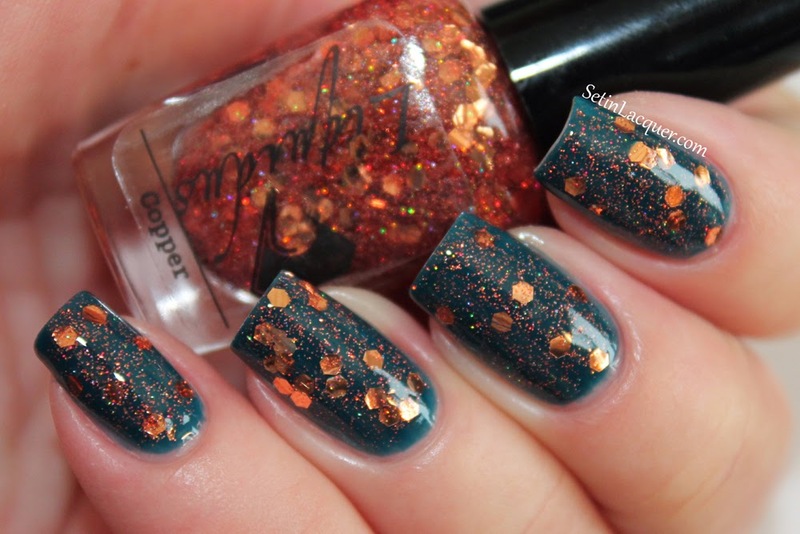 Copper - is a glitter bomb with copper-colored hex and microfine glitter. 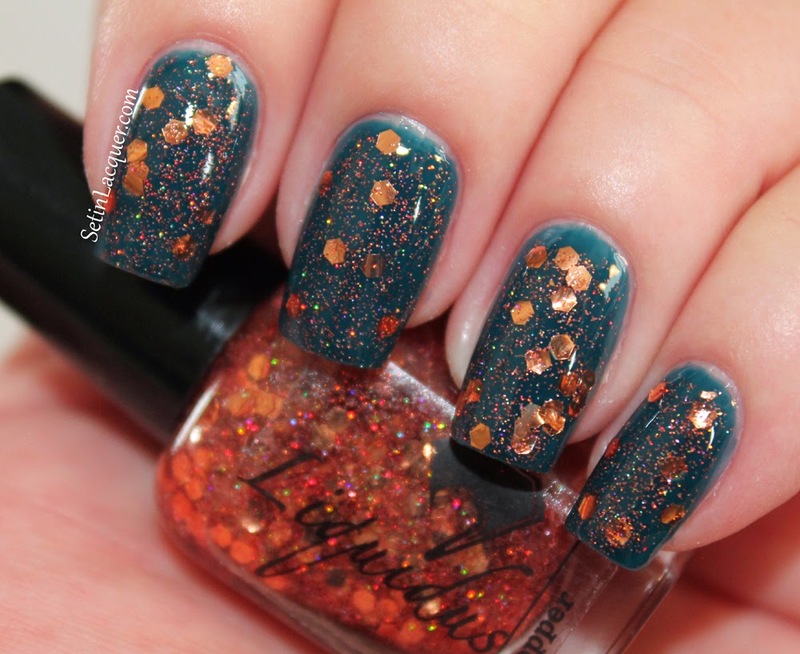 The colors in this astonishing glitter remind me of Autumn leaves. 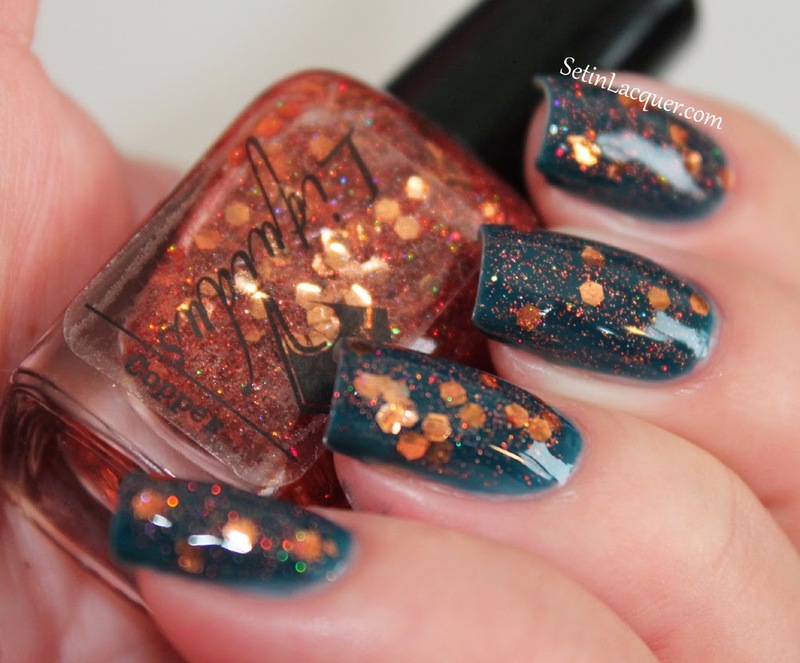 The microfine glitter added depth and dimension to this gorgeous polish. There was no fishing for glitter required with this one. The glitter applied smoothly and laid flat against the nail. I have it on here over Blue Diamond Mine.